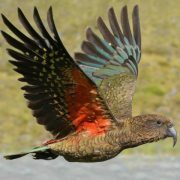 Stunning Keas have been crowned NZ Bird of the Year…Revisiting their messages that they shared April 2016. Keas shares that they are King or Queen of all they survey, but we must also feel like King or Queen of what we survey so that we treasure and caretake what is important!!! “We are scrumptiously hysterically fantastically spectacular clowns.With us Keas it is always about laughter, laughter ready to bubble over, laughter presented and that is the vibe that we live with. We have no wish to be without laughter. We can also be serious, if there is a need for seriousness. We feast on the delights of life. We might have made it all sound like we are senseless and do not have intelligence, but we are ranked by some research that has been carried out as number one parrot for intelligence in the world – pretty impressive!!! 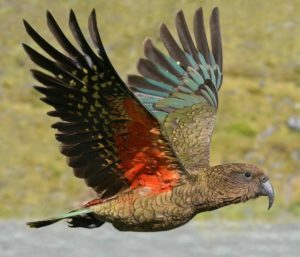 And for people that do not know of us, we are parrots, but we are also the only Alpine parrot in the entire big world – now that alone is spectacular, is it not. For us attitude is the badge that we wear with honour, and the attitude that we wear with honour is relating to ‘can do’ ‘why not’ ‘what is caution – duh forget caution – and live with just doing’. We are great problem solvers, and due to our intelligence we love a quest, a challenge and sussing out what is what and making it work. Our intelligence also leads us to big trouble at times, as we can be so intensely insanely insatiable curious about what is ‘that’, and before you know it we can be dismantling ‘that’ which could be something attached to a vehicle, or ‘that’ could be we have spied someone’s bag and loving the zips or the clasps and start playing pestering away at the bag. Our curiosity is tinged with childlike laughter, and this is our sheer beauty. But some might see our behaviour as malicious or unnecessary, but we as yet haven’t learnt to control ourselves, or fit exactly into the human world of behaviour. We have our own rules, and our rules suit us just fine, and our rules we feel are more in harmony with how it should be. But also in harmony with our natural environment. We actually have great caring, and even though we can be rowdy in energy, rowdy in behaviour at times, we exhibit great caring, and we love hanging out with our family. Keas have great bonds with other Keas and we do work together so that we can achieve. 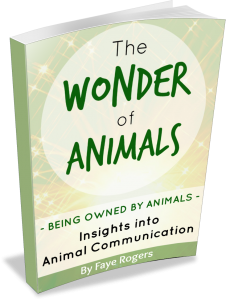 We know that you humans want a deep personal profound message, and yip you will get one – just settle down, and then we will be polite and share away. Even though we have played with words to make us sound fools at times, the words are also jolly. And why not be jolly, why do you have to be so earnest that you forget to be jolly. We do work hard, it’s hard work to survive in our environment. Winters can be utterly ruthlessly cold; but we do find a way to keep ourselves warm, and we might create nest burrows, or we might just flap our wings a bit more than we would if the weather was warmer. Flapping our wings a bit more keeps the blood circulating through our body, and also helps our lungs cope with the cold, remember we live in high altitudes and the higher up in the altitude then oxygen needs can be different depending on species. Oddly enough, we love walking around and yes this can be a parrot thing to walk around rather than just navigating by wing, but the walking is sheer joy for us to do this. We just love the expressions that our bodies feel, we just love the power of walking but also the power of flight. When we do fly, we expose the beautiful undercarriage of our wings, and our natural colouring is olive green with slight iridescent hues captured only on some feathers…But when our wings are stretched out we are displaying orange flashes of brilliance, and it is like we have got jewels hidden from view, and when we take to flight the jewels are exposed. This alone is an important message for humans, and one that we want you to think about for yourself…. What do you expose about yourself? Are there moments when you bring forward your hidden jewels of delight, and the moments are of spectacular-ness. When you take flight and soaring high, you are exposing your own jewels of delight. We blend into our natural environment with ease, and we can camouflage ourselves and be less exposed…or we can be exposed and chatting, walking around, feeling like the King or Queen of what we survey… and we feel like this due to the eager thrust of living. Now take a pause, and go and take yourself for a walk, and alter your energy slightly or alter your energy greatly. Walk around like you own the show with eager thrust of living, and this doesn’t mean you have to knock others out the way or be disrespectful to the environment, but walk around like you own the show and you will feel magnificent because you will relate to the environment and you will hopefully see your environment as something really special and that you are part of the environment. Your environment could be a rural dwelling, it could be a forest scene, it could be a country town, it could be a scenery of water, it could be a high rise busy city scene but it doesn’t matter what your environment is whether it is of green fields or concrete footpaths you have to be aware of the environment that is surrounding you, and that you are energy of the natural and the forces of the natural are spectacular to experience. In one of your huge cities you have air, you have wind, you have insects, and you have much more then this so don’t dismiss walking around and have energy of that you own the show, it is just a heightened feeling that you experience doesn’t mean that others are beneath you, and If you feel like King or Queen of what you survey then you will want the view to be spectacular, and you will find a way to care, you will see that the view is a treasure and you must treasure and what you are treasuring you have to have pride for. Our song that we call out – the simple call of ‘keee aaaa’ and that alone holds its own clues as our voice can vibrate through the forest at a swift speed. And our calling voice of simplicity is also etched on our personalities. As we are also simple, in the respect that we can handle changes, and we don’t over complicate changes. But the simplicity is actually intelligence because we are not struggling too greatly, then we can step into energy of the change with more ease, and use our intelligence to help us cope. Or we become stimulated by the changes, and do not find the changes too demanding, as we stride swiftly forward into changes with more ease than some do. We are rarely shy, and humans invade our environment but we will go to check you out – not with fear stamped on us but of curiosity of what are you up too – and why are you doing that – what is all that about – and other questioning thoughts that we experience. This has also meant that we have learnt to accept humans into our environment, and we have found humans fascinating. Now that is a pretty generous thought of ours isn’t it, that we Keas find you humans fascinating, and you come and stomp into our world, you stamp our world with your desires, but surely we all have the same desires – desires for enough, desires for feeling satisfied with life offerings, desires for good excitement that stimulates, desires for jolly laughter, desires to have connections with others, desires that life is darn well worth living.